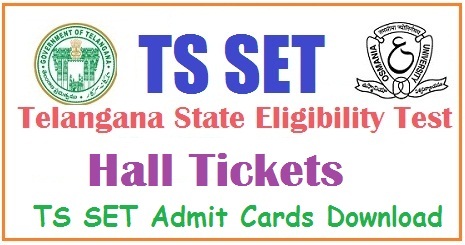 telanganaset.org TS SET Hall Tickets 2019 / Telangana State Eligibility Test 2019 Admit Cards@telanganaset.org : Download TS SET 2019 Hall Tickets/ Telangana State Eligibility Test 2019 Admit Cards @telanganaset.org. TS SET hall ticket 2019 download telangana set exam admit card. Government of Telangana will be soon released Telangana State Eligibility Test (TS SET) 2019 Examination Hall Tickets. A large number of candidates are searching for this TS SET Hall Ticket 2019. So all the candidates who are applied can check and download from official web portal www.telanganaset.org. Telangana SET Subject wise Hall tickets available at Osmania Univertisty official website. Telangana State Eligibility Test Hall Ticket 2019 has been issued by the Osmania University and candidates can download hall tickets from Official Website from 25-06-2019 TS SET 2019 Exam would be Conducted on 5th, 6th and 8th July, 2019 . Telangana SET Exam Conduct seven Centers details are at official website. Candidates who are successfully submitted the of tsset 2019 online application, they can the TSSET 2019 Admit Card for examinations from official website. The Candidates who have wish to Getting Eligibility for Asst. Professors / Lecturers in various universities and degree colleges Post Recruitment the Telangana State Candidates can apply TS SET. The Osmania University Vice-Chancellor has announced the TSSET 2019 notification on 23-03-2019. Telangana State Eligibility Test (TSSET-2019) for the Year 2019 will be conducted by OU for eligibility to appear recruitment exam and promotions of Lectures/Assistant Professors in Degree Colleges as per the University Grant Commission Regulations for the year 2019. The University would invite the online applications from eligible candidates to appear for The Telangana State Eligibility Test 2019. A candidate can avail any number of chances. The State Eligibility Test Telangana State (SET-TS) Examinations 2019 would be Conducted by Osmania University in objective mode on 5th, 6th and 8th July, 2019 The test will consist of three papers. All the three papers will consist of multiple choice questions and will be held on the day of examination in two separate sessions. TS SET 2019 SET will be conducted in 29 subjects i.e., Geography, Chemical Sciences, Commerce,Computer Science and Applications, Economics, Education, English, Earth Science, Life Sciences, Journalism & Mass Communication, Management, Hindi ,History, Law, Mathematical Sciences, Physical Sciencesas per the schedule and the hall tickets for all the subjects will be available at telangana set official web portal.. .
Download the hall tickets and take printout for examination. Note: No request for change of center will be entertained under any circumstances.